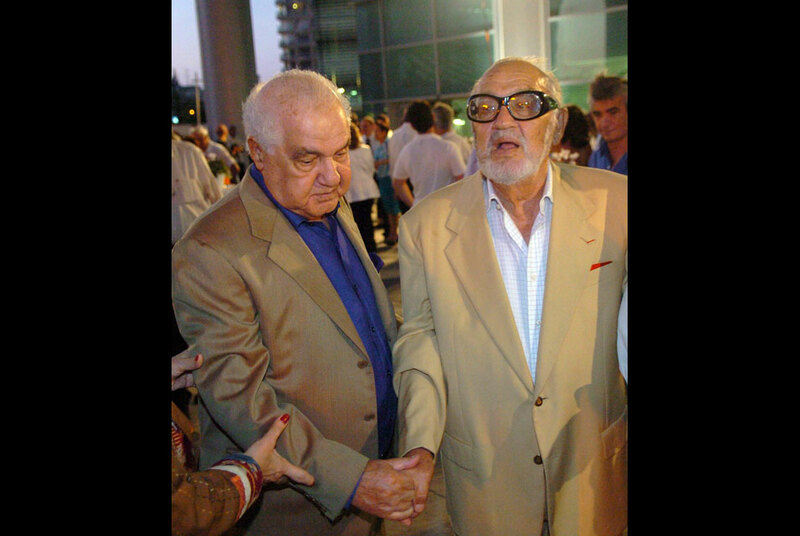 File photo of Israeli business tycoons Yuli Ofer, left, and his brother Sammy Ofer, right, attend a cornerstone laying ceremony. AP Photo/Moti Kimhi, Haaretz. JERUSALEM (AP).- An Israeli billionaire at the center of a recent scandal involving trade with Iran died Friday in Tel Aviv. He was 89. Shipping magnate and philanthropist Sammy Ofer was listed last year by Forbes as Israel's richest person, and appeared as number 109 on the magazine's list of the world's richest people. Ofer's family released a statement saying he died Friday morning at his Tel Aviv home after a long illness. Ofer's name had been in the news since the U.S. government sanctioned his company, Ofer Brothers Group, last month for selling an oil tanker to Iran's national shipping company through a Singapore subsidiary. The move violated U.S. trade restrictions on Iran. That embarrassed the Ofer family and the Israeli government, which has long been a vocal proponent of tighter sanctions on Iran. Israel considers Iran's nuclear program to be an existential threat. Ofer died as calls grew in Israel for an investigation into the affair. Along with his brother, Yuli, Sammy Ofer owned Zim Integrated Shipping Services, one of the world's biggest container shipping companies. The family controls The Israel Corp., with vast assets in shipping, chemicals, energy and transportation, and also has holdings in real estate and banking. The Ofer brothers did not comment publicly on the U.S. charge. A spokesman said the $8.5 million deal, small for the massive conglomerate, was conducted unwittingly with an Iranian shell company. Nonetheless, the company said it was embarrassed. "I think this is very serious. We preach to the world to impose sanctions on Iran, and it turns out that an Israeli company might be involved in dealing with them," Nachman Shai, a lawmaker with the opposition Kadima Party, said this week after the charges were made public. Media reports suggested that the Ofers' ties with Iran might have been authorized by the government, and there were broad hints that their activities were linked in some way to Israeli intelligence operations. Prime Minister Benjamin Netanyahu's office denied that the government had authorized the company's dealings. The family's statement Friday made no mention of the scandal. "Through his children and grandchildren, and in the spirit of the founder, the group's business will continue without change, while protecting our tradition of hard work and commitment, which constitute the great inheritance Sammy left behind him," the statement said. Ofer, born in Romania in 1922, moved two years later to what was then the British Mandate territory of Palestine, according to a brief biography provided by the family. He served on a Royal Navy minesweeper in World War II and later as an officer in the Israeli navy. Along with his brother, Sammy Ofer turned a small family shipping business into a huge international conglomerate, and he moved to Monaco in the late 1970s. He returned to Israel permanently only in the years before his death. In 2008, Ofer donated 20 million pounds ($33 million) to fund a new wing at Britain's National Maritime Museum, which observers said was the largest private donation ever made to a British cultural institution. He was subsequently awarded an honorary knighthood. Ofer, an avid art collector, withdrew a planned $20 million donation to the Tel Aviv Museum of Art in 2006 after other donors objected to naming the museum for him and his wife. Ofer funded numerous other causes in Israel, but the Ofers nonetheless remain a family many Israelis love to hate. Sammy Ofer, with his trademark goggle-like designer glasses, was widely seen as a symbol of the intersection of power and money. Critics have long charged that the Ofers were allowed to buy up privatized government assets at below-market rates and that they wield undue influence on the media and in politics. They were also accused of allowing their chemical and energy businesses to pollute the environment and contribute to the alarming shrinking of the Dead Sea.